Sam is a Learning Specialist with Intuit. Her daily focus is on coaching and developing facilitators around the world to perfect their craft and deliver the best possible experience to those who support Intuit customers. Sam tried her first Crossfit class in late 2015, but didn’t commit daily until June 2016 while traveling for work and visiting various boxes around the US. A coach once quoted James Fitzgerald, “There are few places on earth where we are asked to make that very real connection with our body and our spirit. CrossFit is one of those places. Dig deep, don’t quit, and discover why you are here.” This message inspired and drove a focus inside her. 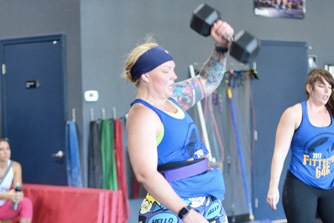 Her passion for Crossfit comes from seeing people improve every day. It’s so exciting to see someone do something they couldn’t do yesterday. Combining a love of Crossfit and a love to see others grow… Sam is driven to fulfil a dream of coaching. Sam tries to remind anyone she speaks with to not compare yourself to others. Everyone has their own strengths and weaknesses. Spend time improving both and enjoy the journey.